For the longest time, it was considered best to use 10×50 binoculars to gaze at the stars. They’re pretty lightweight, don’t cost too much, and they have enough of a field of view to look up at the sky. However, most hand-held 10x50s are at the upper limit of comfort zone. Models that have better magnification or additional aperture usually need a mount or tripod to see steady views. In fact, even a 10×50 won’t work much without some additional support. Sadly, the devices are no longer so portable if you need enough paraphernalia like a telescope. Now, however, there is the image-stabilized binocular. 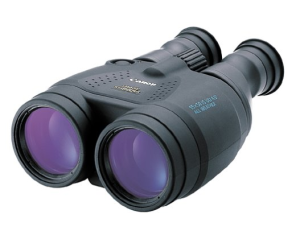 Canon is among those leading the market in top-quality binoculars. To cope with the advancing market, it has developed the Canon Image Stabilization All-Weather Binoculars. The device is made for water sports, hunting, and similar outdoor challenges. The binoculars can be enjoyed without a tripod. For extended use, however, there is a socket that allows tripod use. Unlike other binoculars, this model isn’t meant to be held from the neck. You will need a thick neoprene strap for maximum support if you want to hold it around your neck. Using it in cold weather will require lithium batteries. The binoculars are meant for wet conditions, but you should still use a 58mm hood to prevent stray light. The 18×50 features 18x magnification and 50 millimeters for objective lens. It has a 3.7 degree angle view with a focus distance of about 19.7 feet per 6 meters. It’s a bit heavier, but the 1180 gram weight is due to the image stabilizer. This makes it the new best choice for stargazing. Since its first launch into the market, the Canon Image Stabilization Binoculars have had great reviews. One reason for this is the qualify of images that you can see through them. Using this device, you will definitely get the clarify you desire with a very ergonomic design. The construction is quite strong, meaning it is suitable for most outdoor activities that involve a lot of movement. The lenses are equally great, allowing images to remain clear and vibrant even if you are viewing them from a very long distance. The binoculars are even useful for those who actively wear eyeglasses; there is an eye relief feature available on the device, in fact, if you have such a concern. Finally, its compact design makes it the best choice for comfort while carrying it around, day or night. As far as negative points, there are only a few to mention. The first one would be the heavy weight, making it difficult to wear around the neck. It’s also difficult to carry for a prolonged period of time, so while it is useful for stargazing, you might not be able to handle it for too long without added tripod support. Secondly, the barrels are also mildly stiff, so adjustments may be a little difficult. At least they’ll stay in place once you do set them. Overall, the Canon Image Stabilization All-Weather Binoculars may be a bit pricey, but it’s worth the cost for the image stabilizer. This technology gives it a superior edge due to the convenience of use in all kinds of outdoor activities. The accessories that can be used with it help add to its value as well, such as the lens cap, polarizer glass filter, fog eliminator, tripod and folding stool. With each purchase, you will be able to get some alkaline batteries, a woven strap and a soft case as well as a three-year warranty. Remember to upgrade your strap if you want to wear it around your neck.